No-Stall Shifting: Honda’s exclusive SportClutch is only available on the TRX250X, and it’s a great feature. New riders get to learn clutch control without worrying about stalling, while experienced riders get all the control and freedom to shift the way they normally would. Fresh styling: The 2018 TRX250X gives you your choice of distinct color styles: The new yellow version is unique in our sport ATV lineup. And there’s a slick red color too. 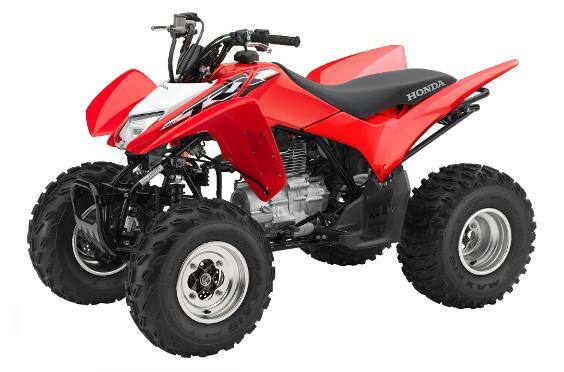 Rugged, reliable 229cc OHV engine: The TRX250X’s lightweight OHV air-cooled 229cc engine is longitudinally mounted, allowing direct driveshaft alignment to rear wheels for more efficient power transfer. The two-valve cylinder head design features performance-optimized valve timing, a 31.5mm-diameter intake valve and a 27mm-diameter exhaust valve contribute to the engine’s broad, usable powerband. 68.5 in. x 41.8 in. 42.6 in.